LOS ANGELES, Jan. 5, 2017 /PRNewswire/ -- IMAX Corporation (NYSE: IMAX) announced that Lionsgate's (NYSE: LGF.A, LGF.B) highly acclaimed award-winning original musical La La Land, from writer/director Damien Chazelle and starring Emma Stone and Ryan Gosling, will receive a special engagement in select IMAX® theatres domestically beginning Jan. 13, 2017. 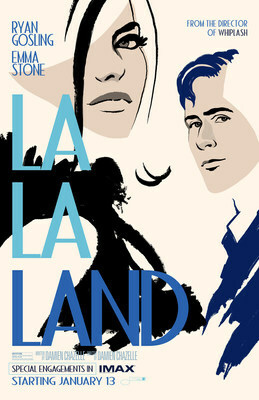 The film received seven Golden Globes® nominations, more than any other film, including Best Picture, and was also named Best Picture by the New York Film Critics Circle. "The beautiful presentation of La La Land in IMAX took my breath away," said director Damien Chazelle. "I cannot wait for audiences to see the work of all the talented crafts-people who helped bring this story to life — the music, sound, production design, costumes, performances — everything explodes in IMAX." "La La Land is a beautiful and entertaining love letter to old-school Hollywood made with a clear passion for the movies, and what better way to savor the music and unique visual style of Golden Globes®-nominated La La Land than in the most immersive movie-going experience possible — in IMAX," said Greg Foster, CEO of IMAX Entertainment and Senior Executive Vice President, IMAX Corp. "We are excited to work again with our friends and partners at Lionsgate, as well as the incredibly talented writer/director Damien Chazelle in bringing this crowd-pleasing film to IMAX audiences around the world." The IMAX® release of La La Land will be shown in its digitally re-mastered format, which includes the image and sound quality of The IMAX Experience® with proprietary IMAX DMR® (Digital Re-mastering) technology. The crystal-clear images, coupled with IMAX's customized theatre geometry and powerful digital audio, create a unique environment that will make audiences feel as if they are in the movie.